Our entire household LOVES fried chicken. Both the breaded and unbreaded type. And we occasionally send out for buckets of KFC or other fast-food versions. Their versions are cooked in “pressure fryers”… a combination of fryer with lid that amps up the pressure. It keeps the meat moist and the skin crisp. A nice kitchen doodad to have at home, but obviously, totally unjustifiable in terms of cost. I decided to experiment with our new pressure cooker to see if I could come up with a fried chicken that was crisp and moist. First, I purchased two magnolia chickens and cut them in half, removing some of the back bone. Next, I brined them in salt water for about 3 hours. Placed them in the pressure cooker with about an inch of water and cooked these at 15 pounds of pressure for roughly 10 minutes or so (after reaching the 15 psi). We let the chicken cool for a couple of hours and patted the skin dry. We deep-fried the chicken in vegetable oil (we didn’t have enough lard handy) and this was the first piece to come out (a half of a half chicken…). It looked great, but tasted a bit bland. 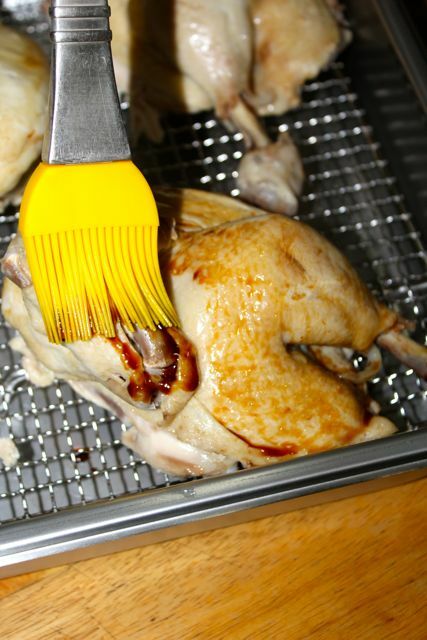 For round 2 of the experiment, we brushed the chicken with some kikkoman and deep-fried that. This turned out a spectacular golden brown and the skin tasted fantastic. I don’t like the trick of brushing lechons with soy sauce because the slow cooking tends to turn the skin bitter, but in this case the quick flash fry and the soy on the skin seemed to work nicely. Served immediately after frying, the skin was glistening, crisp and tasty. The meat was moist, but NOT as moist as it could be, I think. Overall, a definitely 8.5-9.0 out of 10 fried chicken. We never got to an intended Round 3 which was going to coat the chicken in flour and salt and pepper before frying… but maybe next time. The fried chicken looks so delicious I could almost taste it. Amazing how this fried chicken scored (8.75), considering that all you used was salt and some soy sauce. Is it possible that the meat would have been more moist if the chickens weren’t cut in half? Great blistering on the skin; it enhances appetite appeal! Oh yes!…..Max’s style fried chicken….yum! I almost thought that you would pressure fry the chickens. KFC uses a pressure fryer but those are wickedly expensive machines. I’ve always wondered if a pressure cooker could be used for frying. Next time, MM, try that method using chicken wings (less time in pressure cooker) , then coat it in wondra flour, and dip in thai batter or not. Then deep fry. Then again the “easy way” glaze…Coca Cola with soy, brown sugar ginger slivers, garlic slivers….reduced to syrup consistency and then coat the wings…Sprinkle with Montreal steak or chicken spice and chili flakes before eating …..very addicting! This is my variation of those Korean Chicken Wings. Monty, you cannot pressure fry in a pressure cooker (the seals, gaskets and safety mechanisms are designed to resist super-heated water not super-heated oil). You need a pressure fryer, for that. They used to make them for home use, but now only the commercial ones are for sale. 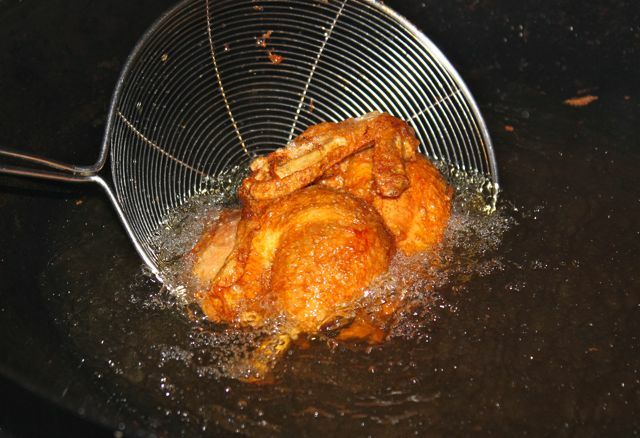 I have heard of a method of “shallow frying” in the pressure cooker – saw it in a Kuhn Rikon recipe book. Basically, you shallow fry the chicken in just 1/4 cup of oil, then, I assume you put it skin-down and close the cooker using the moisture of the chicken to get the cooker to reach pressure. Haven’t tried it but sounds great. 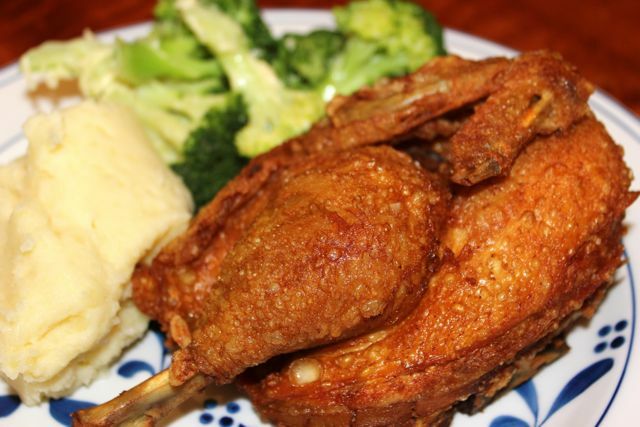 Fried chicken and the last post on pata tim, pato tim – comfort food!! MM, I do something like this whenever I have a hankering for Max’s chicken :) Tweaked a recipe I found some years ago from a magazine. I don’t have exact measurements so it kind’a tastes different every time but I also always get the soft/moist flesh and crisp skin. Instead of salt water, I mix maybe 4tbsp vinegar, a tbsp of salt, 3 or 4 cloves of garlic (mashed), plenty of crushed pepper, then rub the whole chicken inside-out with the mixture and leave it in the chiller for about an hour or so. Pressure-cook the whole thing with some additional water for about 10 minutes, drain and just deep fry it straight away. Recently tried doing it this way for cut-up pieces and still worked well! 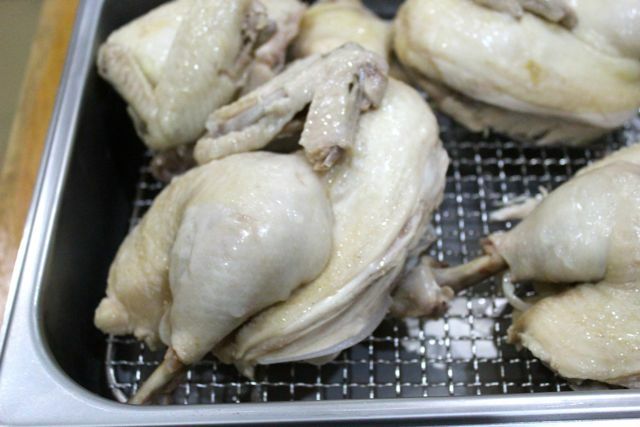 Betty Q – If I was to brine a whole chicken for roasting how much salt and water should I use per kilo of meat? Betty Q – what’s a thai batter? Thanks. lovely! Although for max’s style fried chicken, i do boil the chicken first in salted water with a few bay leaves, peppercorns and lots of parsley. Then let it cool and dry and fry away! Alternately, for a healthier version, we roast a whole chicken in a turbo broiler, simply rubbed with just salt and pepper. Simple, but requires lots of rice! My husband loves them! I can use these pressure cooker experiments! Thanks. Great color. here in brunei, one fast food chain serves ‘broasted’ chicken. It looks like fried chicken but they say it’s broasted instead of fried. I wonder how that is done. Wonderful moist and crispy chicken as well. How do you brine meat? Do you just soak the meat in brine? 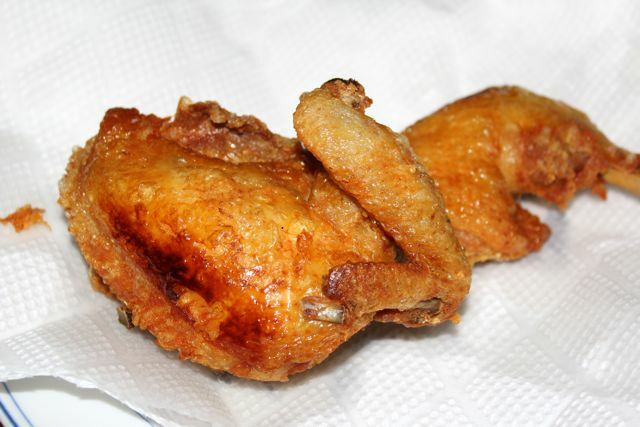 Thais use rice flour on their fried chicken to make it mind blowingly crispy. I’ve tried it at home and it does work! For your next experiment, you may want to try having the chicken quartered, seasoned and baked on a mirepoix in a covered pan( simply seal with foil ). Without pre-heating, dump into the oven, set at 250C thereabouts and bake for an hour. Turn heat off and leave it there to continue cooking in the residual heat for another 30 mins or so. Remove and let it cool, still covered. 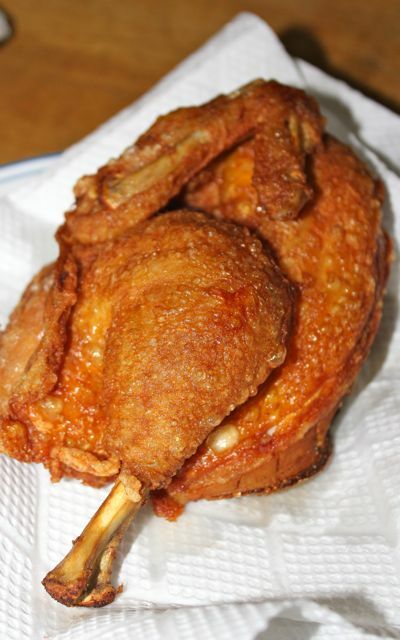 Remove any bones you don’t want, deep fry as is or make a thin batter with the pan juices and coat the chicken with this followed by breadcrumbs. Excess pan juices make a nice sauce.